Show you are never giving up hope by wearing this attention grabbing Awareness Sports Performance Shirt. With its eye-catching design, you can show your support for any cause that is close to your heart. This shirt is great for spreading awareness anywhere you choose, whether it’s at the gym, store or your next awareness walk event. 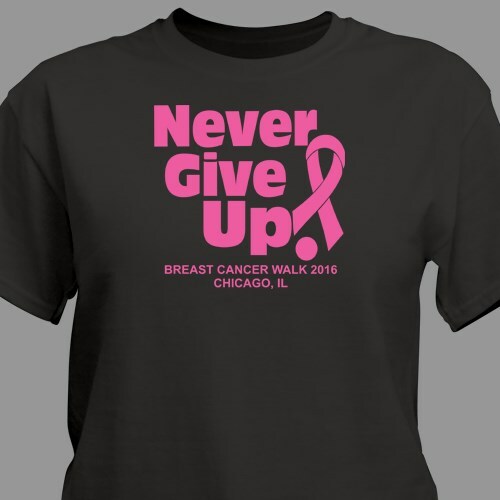 Our Cancer T Shirts is available on our 100% polyester white or black, moisture-management and anti-microbial dry performance sports shirt, machine washable in adult sizes S-3XL. This shirt offers a self-fabric collar & a double-needle stitched hem with tack. Free personalization is included on this design. Just simply enter any two line custom message and choose an awareness color to be printed on this shirt. Nice quality shirt! Print came out nice too. The 2 lines that are personalized should be larger to make their purpose better understood. That said I really like the shirt and the price. Additional Info Our Athletic Dept. Sports Performance Shirt is another great item for spreading awareness. Shop MyWalkGear.com for all of your Awareness Apparel and Walk Gear.